, in various main dishes and in a wide variety of coconut milk dessert recipes. And, while its culinary uses are mostly enjoyed for its unique flavor profile, there are coconut milk nutrition facts that are almost just as interesting! We’ll explore seven here that you might not know about that could have you considering using this exotic gem! 1. Dairy Free! For people who are lactose intolerant, likely the most important of all the benefits of coconut milk is the fact that it’s free from dairy! As such, no adverse dairy druthers need be expected from this sweet milk substitute. 2. Lauric Acid: One of the most interesting coconut milk nutrition facts is lies in its medium chain fatty acids, over half of which are lauric acid. Known as a natural anti fungal, anti bacterial and anti microbial component, there are potential immunity benefits to be gained from incorporating coconut milk into your diet. 3. Omegas! For the non-fish fans, interesting coconut oil nutrition facts that hold true for the milk as well include the presence of Omega 3’s and Omega 6’s, good fats that your body needs for overall good health. 4. Calcium: You may think that the lack of dairy means for a lack of calcium as well, but that’s just not true for coconut milk nutrition facts. While a one cup serving will net you just 4% of your daily value, for non milk drinkers and those that shun cheese, store bought or homemade coconut milk can provide teeth and bones with much needed calcium. 5. Dietary Fiber: You don’t have to pour coconut milk over Frosted Mini Wheats to get a fiber boost. 5 grams of dietary fiber lie in each one cup serving of this delightful treat, and that’s a fifth of what you need every day! 6. Iron: Tasty and delicious coconut milk recipes will also net you an often overlooked source of dietary iron. 22% to be exact and for people who are deficient and who don’t get enough of this important mineral in their everyday diets, coconut milk can be a good alternative source. 7. Manganese: A key nutrient whose deficiency can cause joint and muscle problems, coconut milk is a good source of manganese. While nuts, seeds and spices are still the best sources of this critical component, for those who don’t enjoy cloves or edamame, coconut milk can supplement their intake. 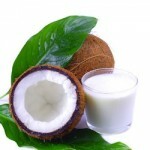 While there are many amazing coconut milk nutrition facts for you to consider, there are some that are less appealing. For instance, this product is very high in calories, and each little tablespoon will net you thirty five. It’s also a high scorer on the inflammatory scale, meaning that it’s potentially more inflammatory than other foods. But, on the other hand, a quick glance at coconut milk nutrition facts will also alert you to the fact that it’s low in sodium and also in cholesterol. One area that is most notably depressing for proponents of coconut milk nutrition is its high saturated fat content. Coconut milk can provide many healthful vitamins, minerals and nutrients and is a great addition to a well balanced and healthy diet whether used for flavoring or as a dairy supplement. However, its high fat content make it a poor choice for those who are dieting or watching their weight, and therefore it should be enjoyed in moderation.